Burdock is the common name for any of the thistles comprising the genus Arctium of the flowering plant family Asteraceae, characterized by globular, generally pink or purplish flower heads surrounded by prickly bracts and with fruits in the form of rounded burrs with many seeds. Burdock is native to the Old World (Europe and Asia), but have been widely introduced worldwide. The roots, leaves, and flower stalks are eaten in various cultures, and in particular the root, with its sweet and earthy flavor, is popular in Japanese cuisine. While the plant is generally considered a weed in the United States, burdocks are cultivated as a vegetable in Japan and some other nations. With its low calorie, high fiber content, as well as various other nutrients, it gained international recognition for its culinary use in the twentieth century as part of the macrobiotic diet. The plant also offers ecological values as a food plant for various animals, including the larva of the ghost moth (Hepialus humuli) and such Lepidopterans as the brown-tail, Coleophora paripennella, Coleophora peribenanderi, the gothic, lime-speck pug, and scalloped hazel. Burdock seeds are dispersed widely by the sticky burrs attaching to animal fur or skin. It was the unique attaching and disengaging mechanism of burdock burrs that inspired the invention of Velcro. The genus Arctium, whose members are known as burdocks, belong to the family Asteraceae, known as the aster, daisy, or sunflower family. These dicotyledonous flowering plants, including the dandelion and chrysanthemum as well, are known for their inflorescence or flower head: A densely packed cluster of numerous, small, individual flowers, usually called florets. Some other characteristics of members of Asteraceae include one ovule per ovary, stamens fused together at their edges forming a tube, fruit in the form of a achene, and the calyx (sepals) of the florets modified to form a pappus, a tuft of hairs, which often appears on the mature fruit. The genus Arctium belongs to a group of flowering plants known as thistles. Thistle is the common name for those plants (mostly in the plant family Asteraceae) characterized by leaves with sharp prickles on the margins. Plants of the genus Arctium are typically biennials or perennials (Keil). The stems are erect and they have dark green leaves that are generally large, coarse, and ovate, with the lower ones being heart-shaped. The leaves are woolly underneath. Members of this genus may have leaves that grow up to 45 centimeters (18 inches) long. The leafstalks are generally hollow. The edible, slender root has a rusty brown skin and grayish-white flesh (Herbst 2001). The composite flower heads often are purplish or pink. Arctium species generally flower from July through to October. The flower heads are surrounded by prickly bracts. The flowers form fruit that are roundish burrs. These prickly burrs are noted for easily catching on to fur and clothing, thus providing an excellent mechanism for seed dispersal (Keil). Burrs cause local irritation and can possibly cause intestinal hairballs in pets. However, most animals avoid ingesting these plants. A large number of species have been placed in genus Arctium at one time or another, but most of them are now classified in the related genus Cousinia. The precise limits between Arctium and Cousinia are hard to define; there is an exact correlation between their molecular phylogeny. The burdocks are sometimes confused with the cockleburs (genus Xanthium) and rhubarb (genus Rheum). The green, above-ground portions may cause contact dermatitis in humans due to the lactones the plant produces. Burdocks are native to the Old World, Europe and Asia, and a number of species have been widely introduced worldwide (Keil). The taproot of young burdock plants can be harvested and eaten as a root vegetable. While generally out of favor in modern European cuisine, it remains popular in Asia, particularly in Japan, where A. lappa (greater burdock) is called gobō (牛蒡 or ゴボウ). It also appears in the cuisines of Korea, where is is called ueong (우엉), as well as in Italy, Brazil, and Portugal, where it is known as bardana. Plants are cultivated, particularly in Japan, for their slender roots, which can grow about 1 meter long and 2 centimeters across. Burdock root is very crisp and has a sweet, mild, and earthy or pungent flavor with a little muddy harshness that can be reduced by soaking julienne/shredded roots in water for five to ten minutes. A popular Japanese dish is kinpira gobō (金平牛蒡), julienned or shredded burdock root and carrot, braised with soy sauce, sugar, mirin and/or sake, and sesame oil; another is burdock makizushi (sushi filled with pickled burdock root; the burdock root is often artificially colored orange to resemble a carrot). Burdock roots also can be shredded or thinly sliced and used in soups and with meats and other vegetables (Herbst 2001). 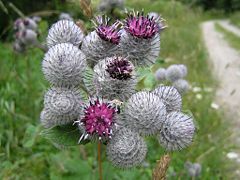 Immature flower stalks may also be harvested in late spring, before flowers appear; the taste resembles that of artichoke, to which the burdock is related. In addition, the young leaves are collected and consumed, such as in salads. In the second half of the twentieth century, burdock achieved international recognition for its culinary use due to the increasing popularity of the macrobiotic diet, which advocates its consumption. It also contains a fair amount of gobō dietary fiber (GDF, 6 grams per 100 grams), calcium, potassium, amino acids, and is also low calorie. It also contains polyphenols that causes darkened surface and muddy harshness by formation of tannin-iron complexes though the harshness shows excellent harmonization with pork in miso soup (tonjiru) and Japanese-style pilaf (takikomi gohan). Dandelion and burdock is a soft drink that has long been popular in the United Kingdom. Italian-Americans are known to use the peeled stems of the burdock. Referred to as "cardune," these stems are prepared in a battered frittata, a common dish on a Saint Joseph's Day table. Burdock is a traditional medicinal herb that is used for many ailments. Burdock root oil extract, also called Bur oil, is popular in Europe as a scalp treatment applied to improve hair strength, shine and body, help reverse scalp conditions such as dandruff, and combat hair loss. Burdock root oil extract is rich in phytosterols and essential fatty acids (including rare long-chain EFAs), which are nutrients used in maintaining a healthy scalp and promote natural hair growth. It combines an immediate relieving effect with nutritional support of normal functions of sebaceous glands and hair follicles. Burdock has been used for centuries as a blood purifier clearing the bloodstream of some toxins, and as a diuretic (helping rid the body of excess water by increasing urine output), and as a topical remedy for skin problems such as acne, eczema, rosacea, and psoriasis. Burdock is believed to be a galactagogue, a substance that increases lactation. Because the roots of burdock closely resemble those of deadly nightshade (also known as belladonna or Atropa belladonna), there is a risk that burdock preparations may be contaminated with these potentially dangerous herbs. Products should be purchased from established companies with good reputations. One should not gather burdock in the wild unless one knows what he or she is doing. After taking his dog for a walk one day in the early 1940s, George de Mestral, a Swiss inventor, became curious about the seeds of the burdock plant that had attached themselves to his clothes and to the dog's fur. Under a microscope, he looked closely at the hook-and-loop system that the seeds use to hitchhike on passing animals aiding seed dispersal, and he realized that the same approach could be used to join other things together. The result was Velcro. One of the most well-known and popular species is Arctium lappa, known variously as greater burdock, edible burdock, or lappa burdock. This species is native to the temperate regions of the Old World, from Scandinavia to the Mediterranean, and from the British Isles through Russia, and the Middle East to China and Japan, including India. It is naturalized almost everywhere and is usually found in disturbed areas, especially in soil rich in nitrogen. It is commonly cultivated in Japan. Cassini, C. n.d. Asteraceae Martinov tribe Cynareae Lamarck & de Candolle. Flora of North America. Retrieved February 14, 2009. Herbst, S.T. 2001. The New Food Lover's Companion: Comprehensive Definitions of Nearly 6,000 Food, Drink, and Culinary Terms. Barron's Cooking Guide. Hauppauge, NY: Barron's Educational Series. ISBN 0764112589. Keil, D. J. n.d. Arctium Linnaeus. Flora of North America. Retrieved February 14, 2009. This page was last modified on 16 February 2009, at 02:06.